Reigning Queens: Queen Elizabeth II: The Queen is one of the few people in the world whose portrait is regularly painted, but this depiction is unique because she neither sat for it nor commissioned it. 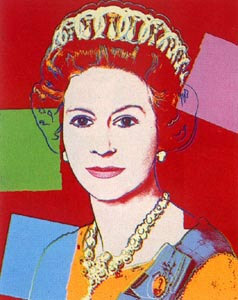 The shape of Warhol's portrait recalls a postage stamp, though the picture of the Queen, taken from her 1977 Jubilee portrait, is head-on instead of in profile. Did she like it? The Queen's opinion of this portrait is not recorded. However, her subjects seem to like it. The National Portrait Gallery promotes it on T-shirts, mouse mats and playing cards. The Queen looks more human here because she is treated not as monarchs are meant to be, but as a celebrity like any other, part of the long list of famous people Warhol depicted.